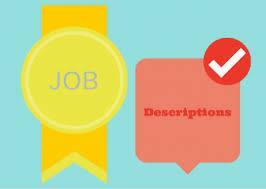 Most companies still use basic job description format since many years, jobseekers feel it as old boring job descriptions. However adding a video and links and all the fancy template designs, it is still appear as a format of title, responsibilities, knowledge requirements, EOE message, and so on. Here recruiter must understand what a candidate is looking for as a job description going to engage and attract the talent your organization wants and needs. Job seekers want to know how you are different than others Over 75% of the jobseekers want to know the salary details for the position you posted. They are looking for brand status of the company and not the fake brand you want them to think you are. They are looking for unique process for all job applicants that treat everyone like the unique. Use your employees as your brand ambassadors to tell candidates what the job truly entails. Present short videos of actual employees in their own words about the job role and company culture. While hiring managers also can tell candidates directly what they like to see from candidates in the position they have open. Videos also work here and use hiring managers' quotes within the job description to highlight important aspects. More than one third of candidates mentioned that they never receive any type of communication to their resume/application. Over 75% candidates want to speak with hiring managers before the process starts itself, so give them that access. Over 50% jobseekers feel traditional job descriptions has seemed like a punishment for those in HR. Having such kind of job postings can be both legally functional and marketing-worthy.